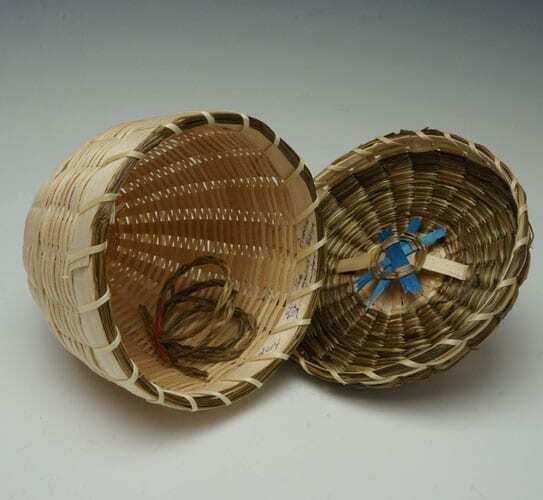 This basket, which lies on its side (bottom is not flat), has a continuous weave spiraling up from the bottom, representing nature. 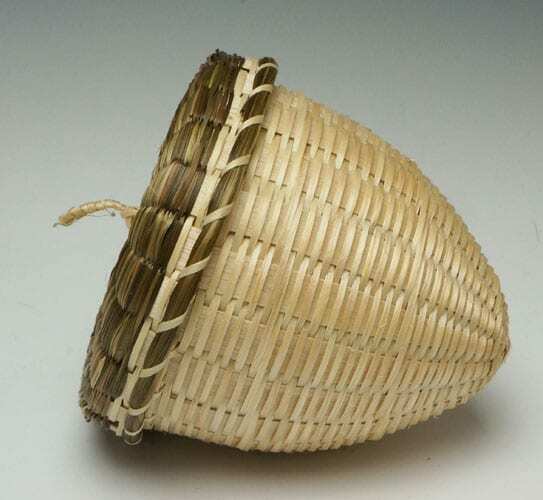 This basket lies on its side, as an acorn does (bottom is not flat). 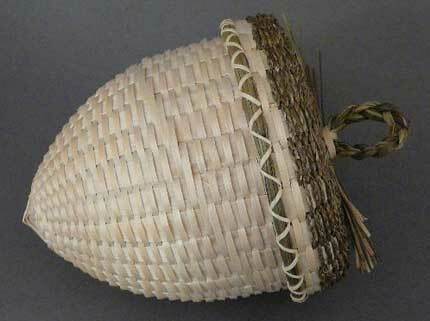 Under the lid of the basket is a turtle, and inside is a sweetgrass prayer braid. 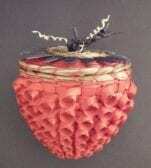 “The acorn is a symbol of life and growth. Everything is connected, represented by the spiral weave. I pray for world peace, for a world full of compassion and tolerance. A world where all of the children love and encourage each other. I visualize the human race enjoying themselves, doing the creative things that make them fulfilled. As I pray, I breathe deep and long intending a moment of peace and contentment to all of my brothers and sisters of the Earth. As I smudge, I imagine the smoke going up, up ,up and out to the whole world and those in need of a prayer. As I practice the healing art of Qi-Gong, I visualize a world of health, strong, bright, and full of laughter and love! As I walk, I take notice of all the beauty my eyes see, all the scents my nose smell, all of the elements my skin feels, all of the sounds my ears hear! And I give thanks for being alive, For being aware, For knowing LOVE! As I write this I can feel my little spirit grow stronger. ‘Cause you see-life is a spiral. What goes out comes back. The more I feel, the more alive I am. The more I give, the more I get. The more I understand about being in the moment, the more beautiful everyone and everything IS! I am calm and relaxed, right now… My being is here to learn how to spread love. My challenges are many, as I experience I gain insight.